Like any other competitive online multiplayer title these days, Dota 2 has its very own ranking system integrated into its own matchmaking queue. Ranked matches in Dota 2 put players into specified competitive tiers, in the form of leagues with associated medals. These medals and the names of their respective leagues are displayed on each player’s profile, showing everyone the highest competitive level that a player has achieved. A player’s progress towards the next level is indicated by a percentage-based counter, found underneath their player card on the main menu of the Dota 2 client. Winning games increases the count, and hitting 100 percent causes the counter to roll over and award the player with an additional level. The system will then place them in the next tier, with a one-star medal. Once players achieve a certain rank, the system will not demote them no matter how many games they lose; thus, each rank is a representation of a player’s highest overall achievement. In order to get their ranks, players must complete a string of ten ranked matchmaking games, which are dedicated for calibrating their rating. After the calibration matches are completed, players are assigned to leagues based on their wins and losses throughout the ten games. Prior to the June 2018 update, calibration matches took individual performances in games into account when placing players into leagues. This mechanic has since been removed, making it so that only wins and losses matter when it comes to calibration. A player’s rank does not last forever, though. Each competitive season lasts for about six months, which medals and leagues resetting at the beginning of every new season. Players that wish to be ranked after each reset must go through recalibration matches, though these games are based on their rank in the previous season rather than starting from scratch. 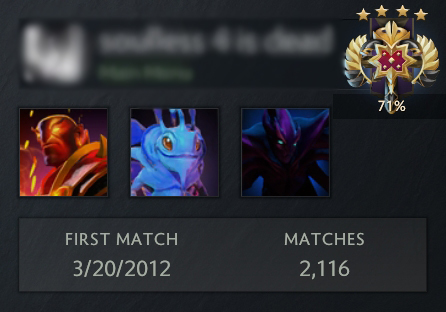 Hidden beneath each player’s medal is a numerical value called “matchmaking rating”, or “MMR” for short. MMR is an exact quantification of a player’s skill level—and unlike medals, this number fluctuates freely when a player wins or loses games. MMR goes up and down by approximately 25 points per win or loss. According to Valve, calibration matches will never rank fresh accounts (i.e. ones that have never played ranked matchmaking before) at more than 3,500 MMR. Players who hit this threshold must win games in order to climb over it and into higher ranking tiers. MMR is only visible to the player himself, and is hidden from other players that are not logged into that account. Thus, player can only track their own MMR’s progression, and not that of their friends or players they encounter in pub games. Moreover, Valve’s method of placing players into leagues based on their MMR is kept under wraps, and no one knows the exact formulae involved in the calculations. MMR is also not the sole determinant of a player’s medal, since there are many cases of players having medals far above the usual MMR range of that ranking tier. The system also remembers and judges players based on their peak skill level more than their current MMR, in order to more effectively prevent smurfing and deranking. 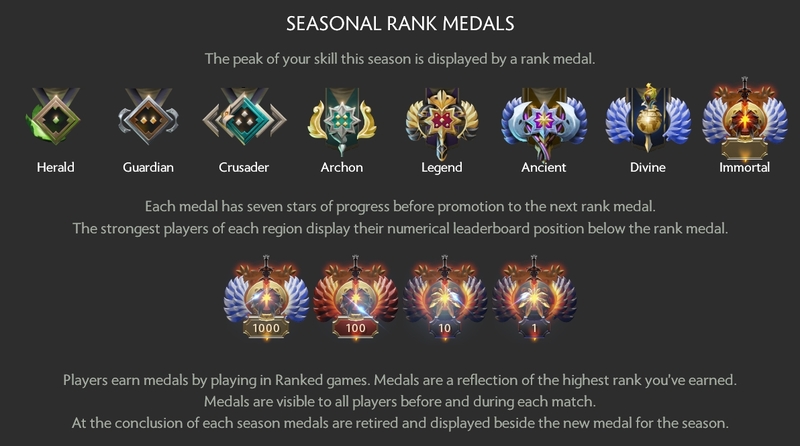 The current ranked matchmaking system was implemented in November 2017, replacing the old system which relied entirely on MMR to determine skill tiers across the entire playerbase. Back then, most people referred to each MMR bracket (separated by 1,000 MMR each) as “divisions”, so to speak, with those that had 6,000 MMR or higher being referred to as “good players”. Valve decided to do away with this in the aforementioned update, presumably to create a more strictly-defined ranking system which doesn’t rely on somewhat arbitrary numbers. Each league in the Dota 2 ranking system is meant to represent the different skill brackets across the entire playerbase, starting with Herald at the bottom and Immortal all the way at the very top. After being placed in leagues by their calibration matches at the start of the season, players must win ranked games in order to climb through the ranks accordingly. Every skill tier has its own characteristics and “quirks”, if you will—with players in each one having observable strengths, weaknesses, habits, and more. It can be said that each league has its own miniature version of the overall metagame, which changes due to the gaps in skill between them. For example, players in the Herald and Crusader tiers (the two lowest leagues) generally have far less mechanical ability and game sense compared to more experienced players. The global distribution of ranks is actually available online for everyone to see, which provides a bird’s-eye view of which leagues have the highest concentration of players. These statistics help you gauge just how well you stack up against the rest of the playerbase around the world, which can be quite interesting if you’re into the numbers and all. You can check out the graph here. Note: The MMR values stated in this section are rough estimates based on what the community at large has observed. They should not be considered exact or accurate. As players at the absolute bottom of the ladder, those in Herald typically have little to no knowledge of the game just yet. In other words, this tier is home to absolute beginners, or those that might not have the time to invest in such a complex game. Herald players tend to lack a basic understanding of Dota 2, and thus may take unnecessary risks in the laning phase, fail to recognize when to fight or retreat, and may even auto-attack creeps without knowing the importance of last hitting. Many of them likewise forget what certain abilities or items even do, which can lead to incorrect responses or a lack thereof. It takes plenty of dedication and patience (emphasis on the latter) to get out of Herald status, but even those in the highest tiers started somewhere. Perseverance and an eagerness to learn the game are essential for climbing out of this rank. The jump between Herald and Guardian really isn’t that large, and are much the same in terms of relative skill level. Players in Guardian, however, tend to have a bit more experience than those in Herald, and can be seen as taking their first steps into understanding the game better. Players in this skill bracket might also be aware that last hitting rewards gold, which is of course an extremely important aspect of Dota 2 and its economy game. Those who played WarCraft III back in the may already be in possession of this knowledge, though. What they do lack is the mechanical skill to apply their newfound knowledge, which holds them back accordingly. After all, all the game sense in the world means nothing if it doesn’t translate into game-winning maneuvers and decisions. To compare this to traditional real-time strategy games like StarCraft, knowing many openings and build orders does not automatically mean that you will win every game; executing the builds themselves is another thing altogether. This tier is when things start to come together for total newbies. Crusader players tend to have a sizable bank of in-game knowledge, which they can regularly pull from while playing. This is typically a result of reading up on heroes, items, abilities, and intermediate concepts online, while also practicing and applying the information to actual games. Against other Crusader players, expect them to know about the existence of Observer and Sentry Wards, which form the core of the vision game in Dota 2. Knowing this, you should pick your spots more carefully and assume that you won’t always have the element of surprise on your side when ganking or initiating. Expect them to also know about the jungle as an alternative source of gold, as well as how to itemize on specific heroes. Archon tier represents the last step before hitting the global average, which we’ll get to in a bit. Players in this bracket will likely have a few hundred hours of gameplay under their belts, with the game sense and mechanical skill to match. The use of non-basic consumables such as Infused Raindrops and Smoke of Deceit becomes more common as well, though infrequent. Archon players exhibit an observable improvement in mechanical skill as well. Contesting creep kills in the lane is a bit more intense here compared to the lower tiers, which separates the dedicated from those that are just here to have fun. Intermediate concepts such as orbwalking, animation canceling, aggro pulling, and even neutral creep stacking likewise show up in this tier. This is also when the importance of balanced drafting starts to become apparent. Picking heroes that synergize well with each other and cover each other’s weaknesses is an easy way to improve your win rate in this tier, so make sure to communicate with your teammates at the draft screen. Legend tier is the global average, making up the vast majority of the entire playerbase around the world. For those that have been around long enough to see the old ranking system, Legend is roughly where 3-4K MMR was before. Players in this bracket tend to have years of experience, possibly dating back to before Patch 7.00 or even DotA Allstars. Thus, you can expect players in Legend to have a lot of in-game knowledge, plus the skill to apply it accordingly. Counterwarding, clever use of the fog of war and the treelines, and proper adjustment of item and skill builds to suit specific situations become common at this level, which can catch some people off guard. Unfortunately, Legend players are still held back by occasional poor decision-making, or by their own mechanical skill ceilings. Players in this bracket may have bad habits that they are unable to get rid of, or simply do not have the advanced mechanics of those in the upper tiers. Their potential certainly makes it very possible to climb out of the bracket, though—so there is hope still. This tier is a nice step up from the previous one, with those who are gifted with great game sense and good mechanical skill being the stars of the show. Ancient players frequently display advanced tactics and finger dexterity, being able to apply their knowledge at a decent level. Role versatility comes into play at this bracket, with some players able to switch freely from positions 1 to 5. There isn’t much else to say about this tier, except that you might find a lot of pretty good Invoker and Meepo players lurking around. Here’s where things start to get really serious. The Divine bracket is where some really scary pub players reside, and a lot of them are able to carry their teams almost singlehandedly at times. For the old folks, Divine is basically the old 5K MMR, which marks a player’s first step into the big leagues in terms of ranked matchmaking. If you ever land here, pat yourself on the back! You’re good at this game for sure. You likely already display a keen understanding of Dota 2, and possess the mechanical skill to back it up. Immortal tier represents the absolute pinnacle of Dota 2 skill, with semi-professional and full-time professional players calling this bracket home. Expect nothing but the best from this league, where highlight reel-worthy plays are a dime a dozen. Players in this bracket are frequently part of dazzling displays of sheer mechanical prowess, or genius-level game sense. These guys live and breathe the game, and sometimes even make a living out of it. Even if you don’t make it to Immortal rank, though, you can still win awesome prizes for winning Dota 2 games on the FirstBlood platform. Sign up for one of our tournaments here. For each major region in Dota 2 (namely America, Europe, Southeast Asia, and China), there exists a regional leaderboard. Players that excel in their respective servers may eventually find themselves in their region’s leaderboard, which solidifies their status amongst the very best players in the region. Only those that prove themselves worthy of the rank of Immortal can even land themselves in the leaderboards, though—along with some other conditions that must be fulfilled. Aside from having an MMR way above average, players who aspire to appear on the leaderboards must have at least 300 matchmaking games played, as well as 100 ranked matchmaking games under their belts. Moreover, they must have played at least one ranked game in the last 21 days, in the same region that they normally play in. The last condition in particular forces top players to maintain their ranks, rather than simply make it to the leaderboards and stop playing in hopes of preserving their spots. Thus, it takes an incredible amount of dedication to stay within the leaderboards. Those that put in the time and effort are rewarded quite nicely, though. For one, their exact position on the leaderboard is displayed in-game, serving as a serious badge of honor that shows everyone precisely how good they are. Also, the Dota 2 client itself allows players that hold spots on the leaderboards to enter their official player information into the system, thus etching their names into the hall of fame for as long as they can maintain their skill level and playing time. The leaderboards also give players a bit of insight on just who has the highest MMR in each region. While MMR is still not readily available for public viewing even when a player reaches the rank of Immortal, one can pretty much guess who rules the roost just by looking at the highest end of the leaderboards. This doesn’t allow us to get an exact value, of course, but at least we know who the very best players in the world are at any given time.